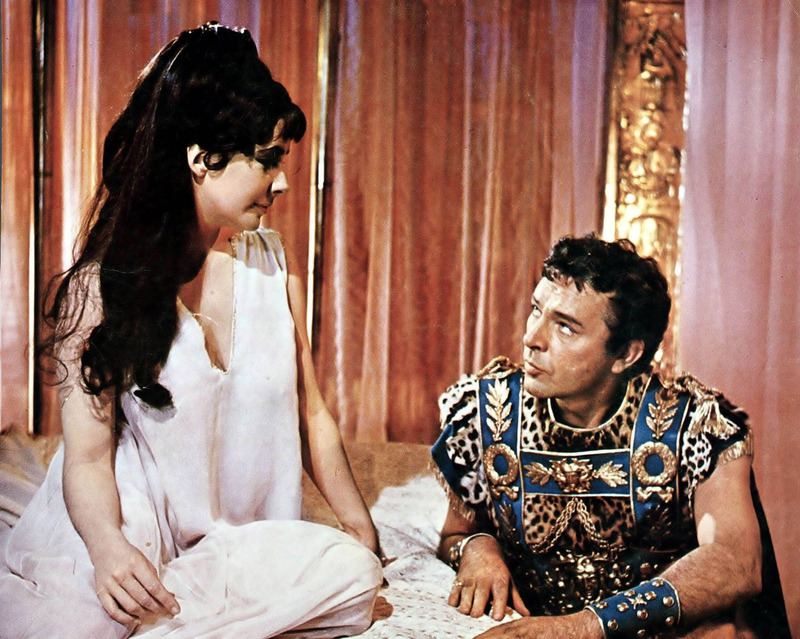 Frances Grahl revisits the 1963 epic, Cleopatra. Row after row of plumed and armoured horsemen gallop into the Forum. Behind them, dozens of decorated chariots. Naked dancing girls whirling long streamers perform a decidedly risqué dance into the widening space. The crowds of bedazzled Roman citizens surge forward, entranced, and are forced back by the guards. Next come troupes of Sudanese warriors, and dancing Black Africans with great tufted head-dresses (of course, as according to the norms of 1963 Hollywood, these dancers look rather more like Black Californian dancers than the subject tribes of Lower Egypt). Feathered filmic fantasies on the theme of witch-doctors leap forward on giant stilts. A scantily dressed Nubian woman steals the scene for a moment, then disappears in clouds of coloured smoke. New rows of pharaonic guards march through the square bearing the great banners of Egyptian sovereignty. Showers of gold coin fall through the air. Suddenly the space is filled with beautiful girls with long, golden wings, pulling behind them a giant pyramid. Is it the queen? The show’s not over yet. The point of the pyramid opens and hundreds of doves fly up and away. A military fanfare. The crowd is frantic. The new banners are made of dangling gold pieces and white plumes. Then come hundreds more Nubian slaves, pulling a great wooden harness. It’s not possible: a giant Sphinx of black onyx is slowly wheeled forward. At its mouth, gold steps lead up to a golden throne. Cleopatra, queen of Egypt, slowly descends to the feet of Julius Caesar. Her dress is a thousand golden feathers, with a crown and golden cloak to match. The Senate rises. The crowds cheer. Caesar nods. Will she? Yes, she will. She’s bending her beautiful head, bowing low before the entire power system of Rome. And as she rises, she closes one beautifully kohled eye at Caesar. First a submission, then a wink. This spectacle, this game of power and diplomacy, this razzle-dazzle transforms the watchers of Cleopatra into Roman citizens themselves, spellbound in the presence of greatness, and the spell is unbroken for four long hours. It’s well-known as the most expensive film ever made, the greatest celluloid manifestation of real-life star-struck stars Elizabeth Taylor and Richard Burton, and in recent years seems to have inspired several new blockbusters to pour lashings of CGI and huge casts into new epics of the Ancient World. The racialised prejudice hasn’t changed but the all-round all-out theatrical ambition of Cleopatra is missing from 300, and Troy, and such nonsense. 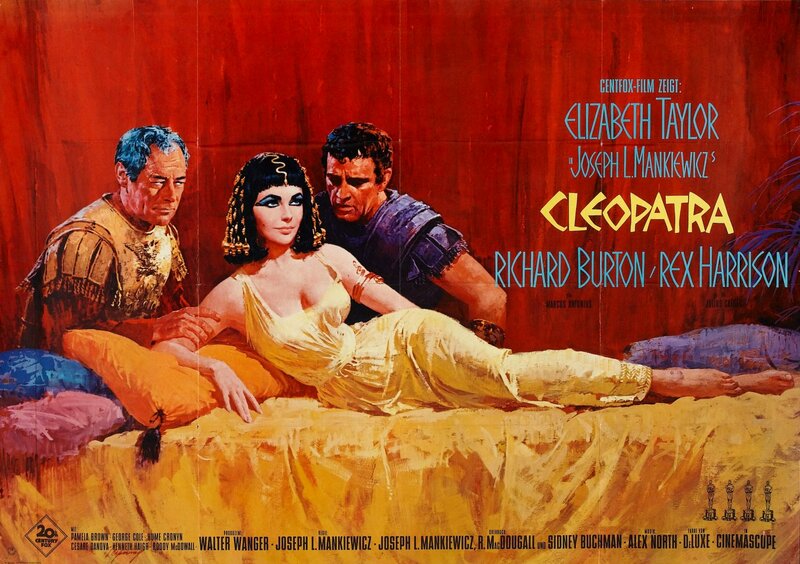 So too are Cleopatra’s two main charms: the elevation of a love story to a tragedy on an imperial scale, and the screen presence of Elizabeth Taylor at her most stunning. When I watched the epic a second time, I became gradually aware of several superb supporting performances. Martin Landau as Rufio is the perfect Roman army officer, brave and loyal to the very end. Roddy McDowall shines in a difficult part as the manipulative, cowardly emperor of rhetoric, Octavian Caesar. And the gorgeous Cesare Danova as Apollodorus, who masks his love for his mistress Cleopatra until the hour of her death (and his), is passionate and honourable, the dark, dashing disciple of a dark, dashing queen. This is the superb Orientalist dichotomy of the film. Cleopatra and Caesar are perfect opposites, and so are their countries. The clash of hearts is mirrored in the clash of East and West. It’s not news that the patriarchal West needs to remodel the Orient in the form of its feminised other, but rarely has this effect been created onscreen with such flair. The East (for so, despite the laws of geography, we choose to represent Egypt) is a woman. It is fertility in the form of the natural wealth of the Nile Delta, and in the form of Cleopatra and the child she will bear Rome. It is magic, gold, offensively effete eunuchs, grand parades of wealth and theatricals without rhyme or reason. Cleopatra is not embarrassed (who was, in 1963?) to bring all this together embodied in one woman, as powerful and ambitious as Caesar yet corrupt, extravagant, driven by emotion and prepared to use ‘torture, poison and even her own sexual charms’ to achieve her political aims. Rome, while not a democracy, has the faulty beginnings of a logical system of government: backed up by violence, of course, but ‘rational’, organised military violence. Cleopatra, as unique ruler and descendant of the goddess Isis, needs no such rationality to justify her rule: merely her own claim ‘I am the Nile’. The brilliance of the film lies in this reduction of war and diplomacy to individuals. And despite its exoticised presentation of Egypt, Rome is never let off. Mark Antony is the other side of the Roman coin, a loyal disciple weakened by the twin scourges of the masculine, virile West: wine and women. As the film rushes (it really does) into its third hour, we see him begin to tear himself apart just as his great passion with Cleopatra begins. The backdrop to their incredible love is the destruction, through Marc Antony’s weaknesses, of Egypt and finally of Cleopatra herself. Anticipation is building up for the release of the new BBC drama of Taylor and Burton’s troubled love. Those interested need look no further than Cleopatra. After Caesar’s death, it feels like Burton and Taylor have no further need to act: they are the queen and her lover; they are Rome and the Nile. Despite the film’s dubious political outlook and its dated use of stereotyped gender roles to incarnate international conflict, the power and tension of this second romance still makes Cleopatra one of the silver screen’s most striking and successful love stories. It seems to me that it would be impossible to make a film to rival Cleopatra again, not because Hollywood is no longer willing to pour millions into huge block-busters (think of Titanic, or more recently The Hobbit), but because those who fund movies these days are totally convinced that there are Titanic audiences, and there are Hobbit audiences and the two won’t switch. There are also love audiences, and war audiences, and great philosophical questions audiences (although these are rather less of a cash-cow), and no one is going to bother with a movie which creates the ultimate tragedy by mixing love triangles with dynastic struggles, marriage with power, and love with war. Frances Grahl blogs at Share or Shelve. Cleopatra will be re-released in UK cinemas on 12 July. What a super, super article; I love your description of that scene. I’ve never seen Cleopatra! I’ve caught an hour here and there throughout my life but it always seems to be the same hour.